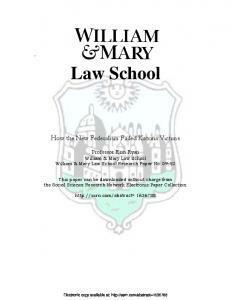 Motive plays an important role in criminal law. 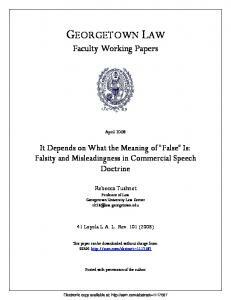 It is necessary to prove liability for some offenses; it is a key component of several defenses; and it has been a.
Dec 14, 2002 - The thesis of this article is that the nature of international trade law is fragmented ... A Group of 20 nations (G-20), represented by their Finance Ministers and ...... All Ortnaw, with the Imperial Citys of Ossenburg, Gengenbach, ..
See e.g. Case 26/62, Van Gend en Loos  ECR 1, at 12 ('the Community constitutes a new legal order of international law'); Case 6/64, Costa v.
Nov 30, 2010 - most distinguishing feature lies in its in-house ..... See e.g. : ECJ, Case 14/83 Von Colson and Kamann v Land Nordrhein-Westfalen  ECR. Founded in 2008, the Centre for the Law of EU External Relations (CLEER) is the first authoritative research interface between academia and practice in the field of the Union’s external relations. CLEER serves as a leading forum for debate on the role of the EU in the world, but its most distinguishing feature lies in its in-house research capacity, complemented by an extensive network of partner institutes throughout Europe. Goals • To carry out state-of-the-art research leading to offer solutions to the challenges facing the EU in the world today. • To achieve high standards of academic excellence and maintain unqualified independence. • To provide a forum for discussion among all stakeholders in the EU external policy process. • To build a collaborative network of researchers and practitioners across the whole of Europe. • To disseminate our findings and views through a regular flow of publications and public events. Assets • Complete independence to set its own research priorities and freedom from any outside influence. • A growing pan-European network, comprising research institutes and individual experts and practitioners who extend CLEER’s outreach, provide knowledge and practical experience and act as a sounding board for the utility and feasibility of CLEER’s findings and proposals. and prosperity and is carried out along the following transversal topics: • the reception of international norms in the EU legal order; • the projection of EU norms and impact on the development of international law; • coherence in EU foreign and security policies; • consistency and effectiveness of EU external policies. CLEER’s research focuses primarily on four cross-cutting issues: • the fight against illegal immigration and crime; • the protection and promotion of economic and financial interests; • the protection of the environment, climate and energy; • the ability to provide military security. Network CLEER carries out its research via the T.M.C. Asser Institute’s own in-house research programme and through a collaborative research network centred around the active participation of all Dutch universities and involving an expanding group of other highly reputable institutes and specialists in Europe. Activities CLEER organises a variety of activities and special events, involving its members, partners and other stakeholders in the debate at national, EUand international level. CLEER’s funding is obtained from a variety of sources, including the T.M.C. Asser Instituut, project research, foundation grants, conferences fees, publication sales and grants from the European Commission. This text may be downloaded for personal research purposes only. 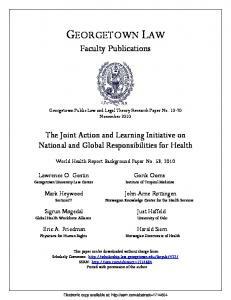 Any additional reproduction, whether in hard copy or electronically, requires the consent of the author(s), editor(s). 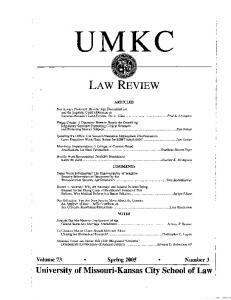 If cited or quoted, reference should be made to the full name of the author(s), editor(s), the title, the working paper or other series, the year and the publisher. The author(s), editor(s) should inform CLEER if the paper is to be published elsewhere, and should also assume responsibility for any consequent obligation(s). 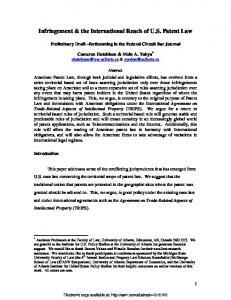 See also earlier in this working papers series: Jan Willem van Rossem, ‘Interaction between EU Law and international law in the light of Intertanko and Kadi: the dilemma of norms binding the Member States but not the Community’, CLEER Working Papers 2009/4. Amsterdam Centre for European Law and Governance , University of Amsterdam; . I would like to thank Joana Mendes, Ronald van Ooik and Jure Vidmar for their insightful comments on earlier drafts. Any remaining errors are of course my own. ABSTRACT Lately, the Court of Justice has been harshly criticised for having unduly restricted the effects of international law within the European legal order. Cases such as Van Parys, Kadi, Mox Plant, Intertanko, and Commune de Mesquer have led scholars to argue that the Court of Justice is becoming less international law friendly. This brings interesting questions to the fore: has the case-law changed? And if there is a change, is this change due to a different attitude of the Court of Justice towards international law? What factors could have influenced the recent decisions of the Court of Justice? This working paper addresses these questions. It analyses the Court’s recent decisions concerning international law, contrasts them with earlier rulings and places them in the broader context of the Court’s understanding of the European legal order. The analysis leads to a more nuanced conclusion. The Court’s attitude towards international law cannot easily be placed on a one dimensional scale of ‘international law friendliness’. Finally, four observations are made on what might have influenced the Court’s rulings in recent years. legal developments. Final remarks wrap up the discussion and sketch a brief outlook into the post-Lisbon era. 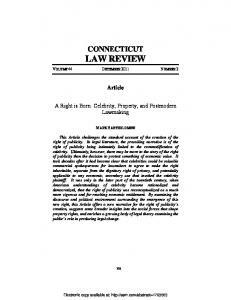 the Czech Republic limiting the effects of the charter.32 It remains unclear whether the protocol excludes the application of fundamental rights as they are expressed in the Charter33 as general principles beyond the limitations of the Charter’s horizontal provisions.34 The lack of clarity on this issue illustrates the continuous important role of the Court of Justice to bridge the systemic flaws of European constitutional law. In the area of foreign policy, the Court of Justice has equally played a pivotal role as constitutional court. The Court has greatly contributed to the Union’s capacity to act on the international plane through the development of its case-law on implied competences and on the above-mentioned duty of loyal co-operation. The former has its origins in the well-known ERTA doctrine,35 which has incrementally been developed into the understanding that implied competences may be both exclusive and shared36 and that even though internal and external competences run largely parallel there is no longer an ‘inextricable link’ between external and internal action. Exceptionally, an exclusive external competence can exist even in the absence of prior internal legislation.37 In the area of foreign policy, the latter (duty of loyal co-operation) is particularly relevant for the exercise of shared competences.38 By way of conclusion, the well-established and partially codified constitutional foundations of the European Union – which we take for granted today – are (to a large extent) the incremental achievement of many years of case-law delivered by the Court of Justice. During all these years, the Court of Justice has filled gaps in the constitutional construction of the European Union, reconciled incoherencies, and given first priority to the effectiveness of European law. At the same time, the Court has contributed to giving the Union the necessary tools to become an international player. Yet, despite the Treaty of Lisbon’s attempts to codify and structure European constitutional law the Court of Justice will need to continue playing an important role as the constitutional court of the Union. also allows the review of the legality of the latter in the light of binding international agreements concluded by the Union.57 For international agreements binding on the Member States only, the European Treaties distinguish between anterior and posterior agreements. The former are agreements concluded before 1958 (creation of the Community) or before accession; they enjoy a special status under Article 351 TFEU. Member States are under specific conditions allowed to derogate from European law to comply with their prior obligations towards third states. The Court of Justice has interpreted Article 351 TFEU (ex-Article 307 TEC) rather restrictively.58 The Court has in particular given the Member States’ duty to give full effect to Union law (paragraph 2) an extensive reading59 limiting the effect of Article 351 TFEU. Yet, even where Article 351 TFEU is not applicable, treaties binding on the Member States only, can have effects within the European legal order. 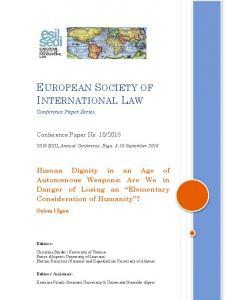 As is well-known, the European Convention on Human Rights (ECHR), a convention to which all the EU Member States but not the Union are parties,60 has long been used by the Court of Justice to fill the gaps in human rights protection under European law.61 But the Court has also conferred a sort of soft law status to other conventions to which only the Member States are parties62 (even if not all Member States are parties) and interpreted Union law consistently as a consequence of the principle of loyal cooperation (Article 4(3) TFEU).63 4.
ments did not contain any provision reserving to the Union the possibility to restrict movements of funds. These rulings confirm the far-reaching nature of the Member States obligations under Article 351(2) TFEU. Furthermore in the case of Van Parys,81 the Court of Justice ended all speculations82 on the enforceability of WTO law after the dispute settlement body (DSB) has declared the European measure to be inconsistent with WTO law. 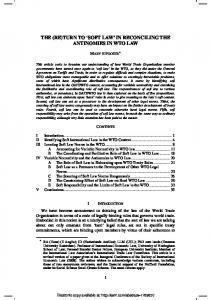 WTO obligations do not have direct effect even if specifically confirmed by the DSB. The Court of Justice confirmed this line in the FIAMM appeal.83 However, the appeal decision in FIAMM is interesting with regard to a different point: the Court rejected the possibility of claiming compensation in the absence of unlawful conduct.84 The conduct of the institutions can only be unlawful if WTO law has direct effect. The General Court’s ruling (allowing as a matter of principle compensation for unusual damage even in the absence of unlawful conduct85 ) had opened a new avenue for compensation for the breach of not directly effective WTO law obligations. The Court of Justice closed this avenue. Finally in the Kadi appeal, the Court of Justice resorted to what it knows best: the European legal order as the one and only frame of reference and was strongly accused to break with its international law friendly attitude of the past by taking a more ‘dualist’ position.86 Kadi concerned counter-terrorist sanctions imposed by the UN Security Council against private individuals. Since the Union is not a member of the UN, the Charter imposes obligations on the Member States only. 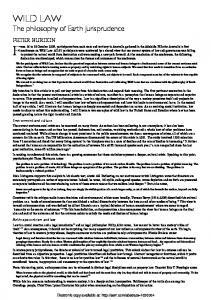 After briefly recalling the Community’s track record of respecting international law,87 the Court left no doubt that “[t]he question of the Court’s jurisdiction arises in the context of the internal and autonomous legal order of the Community, within whose ambit the contested regulation falls and in which the Court has jurisdiction to review the validity of Community measures in the light of fundamental rights.”88 Hence, the Court of Justice saw no legal reason under European law for denying judicial review,89 and annulled the European measures adopted to give effect to UN Security Council resolutions. 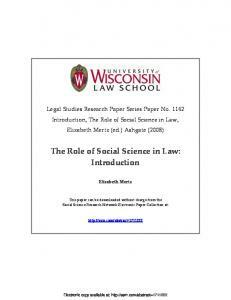 to confer rights upon individuals in order to be directly effective (invocable)? On the one hand, there is evidence that the Court of Justice appears to see the conferral of rights on individuals as a crucial criterion. 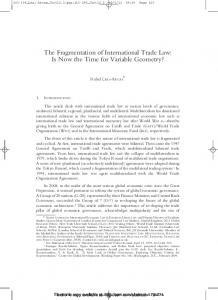 This was for example the case in Intertanko122 or in the body of case-law dealing with WTO law. On the other hand, the Court of Justice has ruled in the Biotech case that ‘[e]ven if […] the CBD [Convention on Biological Diversity] contains provisions which do not have direct effect, in the sense that they do not create rights which individuals can rely on directly before the courts, that fact does not preclude review by the courts of compliance with the obligations incumbent on the Community as a party to that agreement’.123 This might require further qualifications in the future. This includes qualifications that, by falling short of what scholars and litigants hoped for, might appear as new limitations. policies are not as significant as some claim,140 it is likely that the Court of Justice will play an important role in defining the scope and meaning of the new Treaty provisions. To give but one example, Article 3 (2) TFEU sets out the exclusive competences of the Union to conclude international agreements, while Article 216 (1) TFEU provides for Union competences to conclude international agreements without specifying whether these competences are exclusive. The two articles differ but both appear to codify the case-law on exclusive external competences.141 Also, the Court of Justice has now been given slightly more jurisdiction over issues of Common Foreign and Security Policy (CFSP). It has the power to rule on the legality of counter-terrorist measures against individuals (Article 275 (2) TFEU). Article 40 TEU, the successor of former Article 47 TEU, no longer prioritizes former-Community policies but has set CFSP and other policies on equal footing. 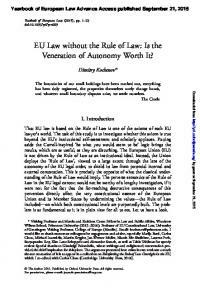 The Lisbon Treaty further makes clear that the general principles of European law as they are set out in Title I of the TEU apply to the whole of European law.142 Within the scope of its limited jurisdiction over CFSP matters, this will require new consideration by the Court of Justice.143 Furthermore, the great constitutional effect of the ECHR, as a human rights treaty to which only the Member States but not the Union are parties, might decrease as a result of the binding force of the Charter of Fundamental Rights. This would then be a consequence of a change of law and not a change in attitude of the Court of Justice towards international law. Accession of the Union to the ECHR would again change the situation.144 It would make the Convention directly binding on the Union which would place the Union and its institutions under external (human rights) review.. The general principles of Union law expressed in the now binding Charter of Fundamental Rights do not completely but largely align with general principles of international law.145 Where they differ from international law new room for litigation and for ‘less international law friendly’ interpretation will develop. 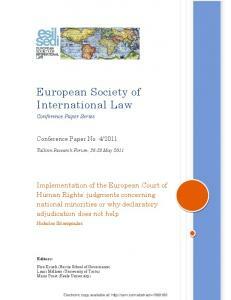 Report "International law as law of the EU: The role of the ... - SSRN papers"